With Q1 behind us, I thought many of you would enjoy (and hopefully learn) from some of the mistakes your peers have made this past quarter regarding how to lose a deal by not following up effectively on a lead. As a refresher, my company helps other companies tune and optimize their sales processes. We do so in many ways, one of which is trying to purchase your product or service, and then measuring the response time from your company once we initially reach out to you. As we all know, following up on a sales lead is both fundamental and quite critical. However, as we demonstrate below, this key element to a finely tuned sales process is often overlooked or acted upon so slowly that a potential “hot” lead quickly turns “cold.” What’s even worse is that very often a potential buyer is also attempting to reach out to your competition at the same time. This means that you are in a race to get to a prospect before your competition makes their initial first impression. Given the criticality of this scenario, we are actively collecting, benchmarking, and archiving our findings. We will share these measurements with everyone through our monthly, quarterly, and yearly benchmark finding publications as our on-going research continues. We hope you see value in this. The list below starts with the fastest of slow responses, to the slowest of slow responses. 5. Founded 16 years ago, this software firm offering cloud-based accounting services has averaged 42% growth over the last three years. We clicked this company’s primary call to action, “Contact Sales,” from their website, and we filled out the form that included our name, email address and phone number. We waited for a response. 16 minutes later our phone rang and a sales rep left us a polite and professional voicemail. 27 days later we have had zero additional follow-up and no type of email outreach or email drip campaign. 4. We attempted to get a demonstration from this 17 year old, New England based software firm once voted as “one of the fastest growing NH based companies.” Following this company’s website primary call to action we clicked the “ Request a Demo” tab. We received a personalized email response five hours later asking us when we would like to schedule our demo. Two days later we also received a standardized spam-ish looking email offering us a free copy of a white paper and telling us “they hope to chat with us soon.” Since the initial personalized email response, we have not been contacted again. It’s been 12 days. 3. We reached out to this medium-sized software/hardware firm located in New England that was founded 17 years ago, to attempt to get a demonstration of their offering. Their website primary call to action is literally, “Click here for a free trial.” So we did, and once again nothing. Even though they had our name, email address, phone number, we have yet to hear anything from them. No response. That was 14 days ago. By the way, they recently paid a lead generation firm to drive leads for them. Unreal right? 2. We approached this large local chamber of commerce actively seeking to grow membership to inquire how we would go about joining the chamber. After three attempts we finally got an response, which was essentially, “we take all major credit cards and checks.” We asked how we could sample the quality of the events and evaluate the overall value of the chamber to help us measure our membership ROI. After waiting two weeks for a response, we were told we should attend one of their larger events. We pushed back and asked for a free ticket first, and as you might have guessed they said “we don’t normally do that, but in your case we will make an exception.” So, we attended the event where we were greeted by our new member ambassador who happily gave us the paperwork we would need to sign to become a member. The paperwork also had the contact information we needed when/if we wanted to join. We concluded our pre-event meeting and went our separate ways. Since the event we have received only one email asking if we would like to join. We intentionally did not respond. In 6 months since that one email, we have heard… you guessed it, nothing. No follow-up email, no phone call. Absolutely nothing. No response. 1. Next up, an eighteen year old software company, focused on cloud-based retail marketing technology. We requested demo’s on three different dates and times over six months. Absolutely no response. Attempted to contact them by using the “Contacts Us” tab to inquire about their partner program and help broker a meeting and demo with a potential prospect. This included giving them (again) our name, email and phone number. Absolutely no response. Finally, we simply called their 800 number and were shocked to hear that they had failed to change the auto attendants recorded greeting to reflect their new name. The recording also did not give us any way to “hit 1 for sales, 2 for customer service,” so our call was actually disconnected which gave us …no response. When we brought our findings to leadership they uncovered another 40 requests for demo’s of their software, valued at $1 million dollars that had never been followed up on. 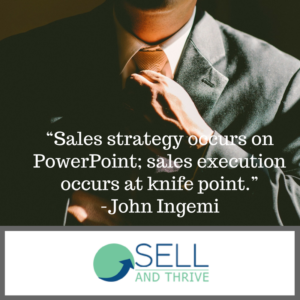 John Ingemi is the Founder and CEO of Sell And Thrive, a sales process consulting company located in New Hampshire. John frequently Blogs about how his experiences with sales processes and tactics from the lens of a consumer, and how they often time intersect with everyday life.